During the Allied invasion of France (Operation Overlord), the Maquis and other French resis­tance groups played a role in delaying the arri­val of Ger­man rein­force­ments to the Nor­mandy beach­head as well as in the even­tual Allied vic­tory in France. The FFI (Forces Fran­çaises de l’Inte­rieur for “French Forces of the Inte­rior”) and Francs-tireurs sabo­taged rail­road tracks and repeatedly attacked Ger­man Army equip­ment and garri­son trains on their way to Nor­mandy. Thanks to coded mes­sages trans­mitted over BBC radio, the maquisards (as Maquis members were known) were alerted of the im­pending D‑Day inva­sion by listening for pre-arranged mes­sages read in a continuous flow over British airwaves. As Allied troops advanced from their beach­heads in June 1944, the FFI, whose ranks approached 200,000, rose against the Nazi occu­pa­tion forces and their garri­sons en masse. 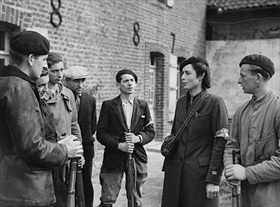 On this date in South Central France, one group of 7,000 ma­qui­sards (the group led by British Special Opera­tions Execu­tive [SOE] agent Nancy Wake, who was married to a French­man) began a series of pitched battles against up­wards of 22,000 Ger­man sol­diers. Between April and August 1944, Wake’s group accounted for 1,400 Ger­man casualties, while losing only 100 themselves. 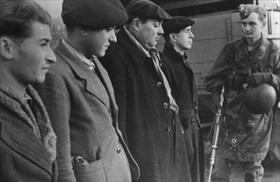 On the Vercors plateau west of the French Alps, a Maquis group led resis­tants in estab­lishing a short-lived Free Repub­lic of Ver­cors in June and July 1944, which ended in defeat and civil­ian atro­cities. When engaging the enemy, some Maquis groups took no pri­soners, so enemy soldiers often prefer­red to sur­render to Allied sol­diers in­stead of facing the ma­qui­sards. 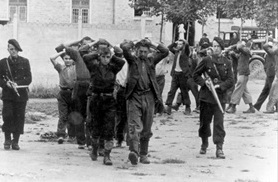 Ma­qui­sards, whether cap­tured by the Ger­mans or by Vichy France’s Milice (French mili­tia), faced tor­ture, death, or con­cen­tration camps, where few survived. 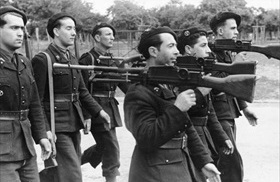 When Gen. Charles de Gaulle set up a Free French admin­is­tra­tion after liber­ating Paris in August 1944, many ma­qui­sards returned to their homes but many also joined the new French Army to con­tin­ue fighting the Ger­mans. France was rewarded for its tena­city against Adolf Hitler’s tyran­ny by joining the U.S., Britain, and the Soviet Union in sta­tioning troops and admin­is­trating zones of occu­pa­tion in a defeated Ger­many. The French zone lay to the east of the Rhine River, the decades-long contested boundary between France and Germany. 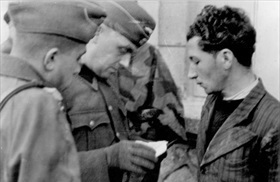 Left: French resistance fighters with Francs-tireurs and Allied para­troopers share infor­ma­tion during the Battle of Nor­mandy, June 6 to mid‑July 1944. 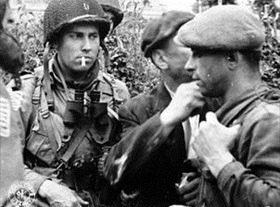 Right: Members of the Maquis in the ham­let La Tresorerie near Bou­logne-sur-Mer along the Pas-de-Calais coast, Septem­ber 14, 1944. The female figure bears a close resem­blance to the British SOE agent Nancy Wake.